Why do we almost always eat some vegetables raw, while others are typically cooked? I don’t have an answer, but I know that I was surprised when I recently saw a hundred-year-recipe for Scalloped Cucumbers. And, since it’s cucumber season, I decided to give the recipe a try. The Scalloped Cucumbers were delightful. 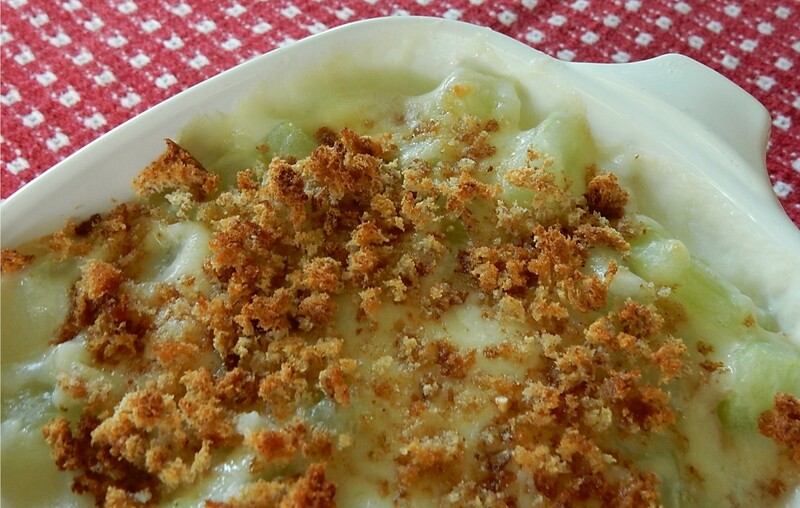 The cooked cucumbers still had a hint of crispness, and when mixed with onion slices in a creamy sauce, and topped with cheese and breadcrumbs, this makes a perfect vegetable side dish. Cucumbers are a tasty vegetable . . . regardless of whether eaten raw or cooked. Remove the skins from the onions, and then thinly slice. Place in a saucepan and cover with water. Bring to a boil and cook until tender (about 10 – 15 minutes). In the meantime, in another pan, using medium heat, melt butter; then stir in the flour, salt, and pepper. Gradually, add the milk while stirring constantly. Continue stirring until the white sauce thickens. In a large buttered casserole dish, layer the white sauce, cucumbers, and onions. End with a layer of white sauce. Then sprinkle the grated cheese and breadcrumbs on the top. Bake in the oven for 20 – 30 minutes or until hot and bubbly. *The original hundred-year-old recipe also indicated that nuts or cereal could be used as a topping. I didn’t salt the water when I cooked the cucumbers and onions: instead I put some salt in the white sauce. And, I didn’t “butter and crumb” my casserole dish; I just buttered the dish. It worked fine with the crumbs just sprinkled on top of the dish. I love all the fresh summer produce at the farmer’s market. 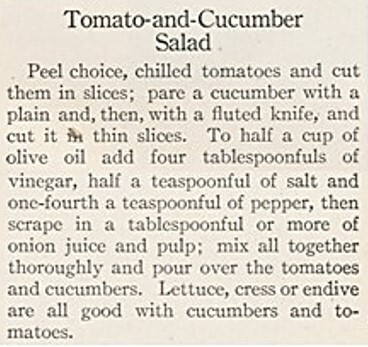 Two of my favorites are tomatoes and cucumbers, so when I saw a hundred-year-old recipe for Tomato and Cumber Salad I knew that I had to give it a try. The salad was delightful, and had a light vinaigrette dressing that enhanced the sliced vegetables. 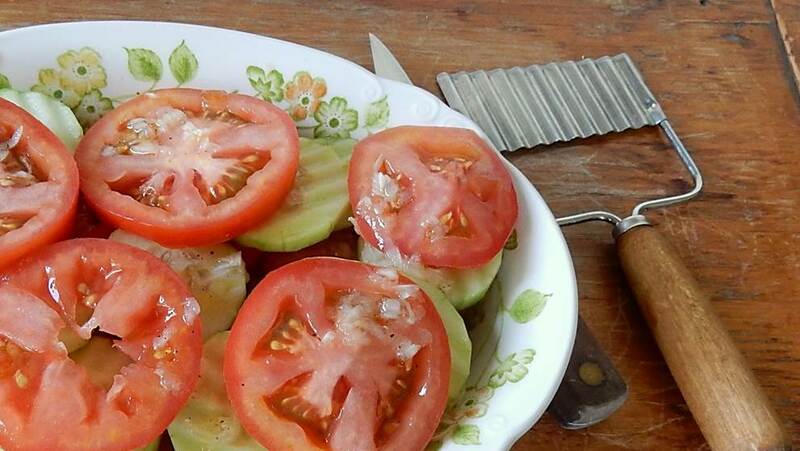 Slice the tomatoes, and pare the cucumbers with a regular knife and then slice (using a fluted knife if desired). Arrange the sliced cucumbers and tomatoes in a serving dish. Set aside. To make the dressing, put the olive oil, vinegar, salt, pepper, and grated onion in a small bowl. Mix thoroughly and then pour the desired amount over the tomatoes and onions. Extra dressing may be refrigerated and kept for several days. My fluted cucumbers didn’t look like the ones in the old photo. Maybe they used a different type of knife. 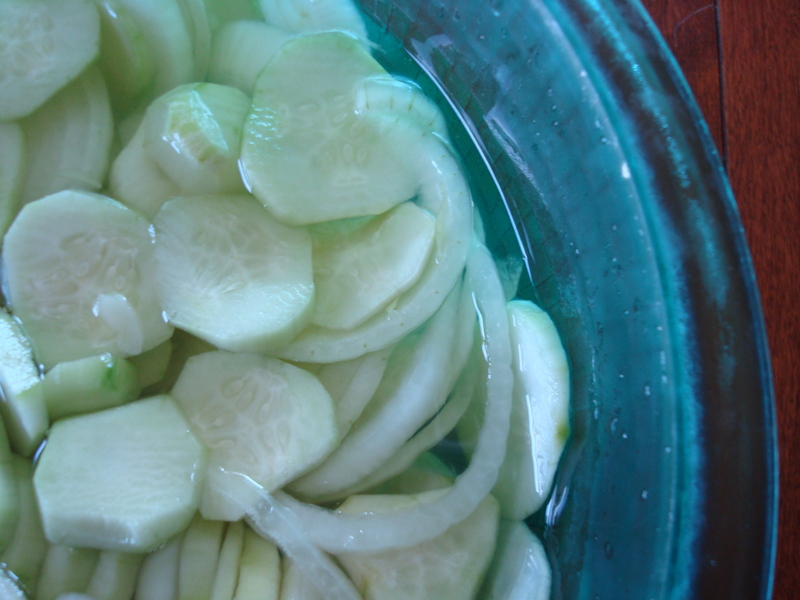 I had a problem – too many cucumbers to eat in salads, but not enough to make pickles. This sent me searching through my hundred-year-old cookbooks for cucumber recipes. One cookbook suggested dipping cucumber spears into a batter and then frying them. I decided to give it a try. The Fried Cucumbers were delicious and easy to make with a lovely crispy coating and a delightful slight crunch when I bit into them. They are versatile, and make a great appetizer or side dish. Fried Cucumbers would be lovely with a dipping sauce – though it definitely is not needed. Prepare a batter by combining the flour, salt, eggs, and milk in a mixing bowl. Beat until combined. Cut the cucumbers into spears that are approximately 1-inch wide. Dip the spears in the batter. Heat 1/2 inch of shortening or oil in a large frying pan. Carefully place the breaded spears in the pan in a single layer. Depending upon pan size, the spears may need to be cooked in several batches. Fry for about a minute or until the bottom side of each cucumber spear is lightly browned, then gently turn and fry until the other side is browned. Remove from pan and drain on paper towels. Serve immediately. And, here is the description in the old cookbook about how to prepare cucumbers. I didn’t try the suggestion for boiling and mashing them (there’s always another day), and just followed the instructions in the last paragraph about frying them.